Купите ли вы PS Vita, если там выйдет новая часть Сирены? Нет, не куплю. Буду ждать порта на ПК. 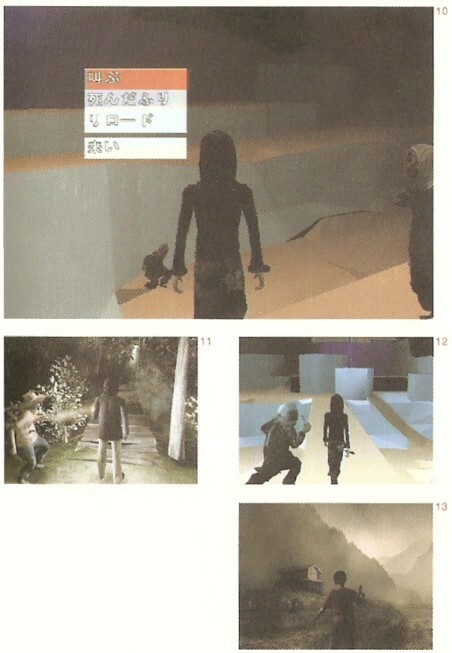 After the character models and motions are complete, a "world" for them to freely walk about in must be constructed using polygons. The "balance check", seeing how playing the game as a whole will feel, is also essential. 10 - Checking characters' movements etc. using a field without textures applied. Is the "Play dead" in the menu one of the staff's games at this stage? Here, we will give you a taste of the atmosphere behind the scenes during the development of Siren. Waiting to have his Shibito makeup applied is a member of the development staff who managed to squeeze his way into a role. While he waits, he reads the magazine "SPA!". There is also Natsuki Okamoto, the talent who plays Miyako, a girl who appears domineering until connecting with Kyoya. Even without makeup, she is incredibly cute. And her lunch from that day... This is what everyone ate as they worked hard! When the characters are created using photoreal methods and given movements using motion capture, all that remains is to give them a field in which to move. Prepared for this is a special stage, without textures applied. The field, created with raw, makeshift grey polygons, like a world make of building blocks... Hanuda Village, covered with white fog and overflowing with an oppressive atmosphere, hardly seems real. At this stage, the player character can be tested walking, running and climbing on all kinds of terrain. They can also troubleshoot issues like "this area is actually too narrow to fight in" or " this area makes it easy for the character to get stuck", used as feedback for development. Also, lots of the photo data later used to create textures that are applied to the polygons was actually taken by the development team at real abandoned villages and mines they visited across Japan. The stains on wooden walls and red rust on tin signposts in the game may well remain somewhere in Japan at this very moment. The construction of detailed things like bridges and steps were also reproduced faithfully from places they actually visited on location, so it is perhaps not impossible that someday you who have played Siren, too, may find yourself lost in a place that seems somehow familiar... A fine-tuning of gameplay elements, like where and how sightjacking is used, is also performed at this point. Things such as how the positioning of snipers on rooftops and the locations of buildings affect gameplay is noted at this stage, and connected to the final version. Used for reference, this version is created as a kind of practical test. Cheap music, reminiscent of old Famicom games, plays in the background... The "Play dead" option in the menu also shows the development staff's sense of fun.